Greek Prime Minister Alexis Tsipras won a confidence vote in parliament on Wednesday, clearing a major hurdle for Greece's approval of an accord to end a dispute over Macedonia's name and averting the prospect of a snap election. Greece's Prime Minister won a confidence vote in parliament late on Wednesday (January 17). It cleared a major hurdle for the government's approval of an accord to end a dispute over Macedonia's name, and averted a snap election. Alexis Tsipras claimed a narrow victory - with 151 votes to 145. (SOUNDBITE) (Greek) GREEK PRIME MINISTER, ALEXIS TSIPRAS, SAYING: "I call upon you with hand on heart to give a vote of confidence today to the government which gave battle, which bled, but managed to haul the country out of memorandums and surveillance." Tsipras called for the vote after his right-wing coalition partner quit the government earlier this week. He stood down in protest over the name deal signed by Athens and Skopje last year, after decades of debate. Macedonia is the name of Greece's biggest northern region, but the deal sees neighboring country - also called Macedonia - renamed the 'Republic of North Macedonia'. Critics argue the decision is an attempt to appropriate Greek identity. Those in favor point out the name change is needed for the tiny Balkan state to be considered for European Union and NATO membership. The head of Tsipras' main opposition repeatedly called the administration a "ragbag government" - clutching at straws to stay in power. 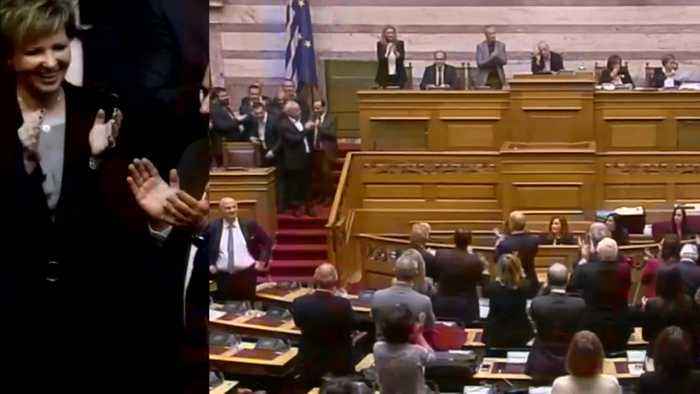 This is the second time Tsipras' government has survived a no-confidence vote. In June the opposition called for a vote when Greece and Macedonia agreed on a compromise. Tsipras' four year term will end in October.